Cal State Fullerton kicked off NATM 2014 with a bracelet-making event for staff, athletes, and anyone who wanted to support the athletic training profession. The bracelets were a symbol of encouragement, serving as a reminder to athletes and anyone else wearing them that ATs have their backs even through the tougher days. 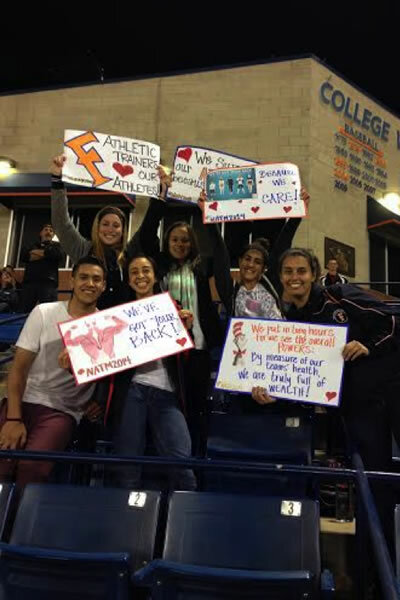 CSUF ATP students also dedicated an evening to support the baseball team. With the help from the campus, the ATP also gave back to the local community by successfully hosting a canned food drive. It was a happy NATM for the Titans!